is an easy side dish you can put together quickly using puff pastry. Spinach and bacon go together like hand in glove. I had an extra pastry crust that needed to be baked so I made this easy spinach and bacon tart. It always makes me happy when I pull out ingredients from my fridge and make something that turns out just right. It doesn’t always work out that way but that’s another post. You can make a weeknight dinner special and serve a spinach and bacon tart with a mixed green salad. If you have an unexpected guest (maybe the ‘boss’!) you will definitely make points with this tart. Frozen puff pastry and fresh baby spinach are key ingredients to making this a quick and easy recipe. This is also a very flexible recipe so you can use whatever cheese you prefer. I used Gruyere cheese (it’s one of my favorites) for the mild nutty flavors that blend well with the spinach. But you can use goat cheese or feta cheese which also pairs well with spinach. Cook the bacon and drain on paper towels. Chop into bite size pieces. This Spinach Bacon Tart is gorgeous! Stumbled. What a gorgeous spinach bacon tart. Love this ! And the cheese! Puff pastry too. So enticing! Spinach Bacon Tart sounds wonderful and definitely I see it being something I would like to add to my menu ASAP!! Spectacular!!! I love everything that went into this piece of art! Looks delicious! I would totally use feta, I love feta! What a great combo for a tart here!! Thanks for sharing. 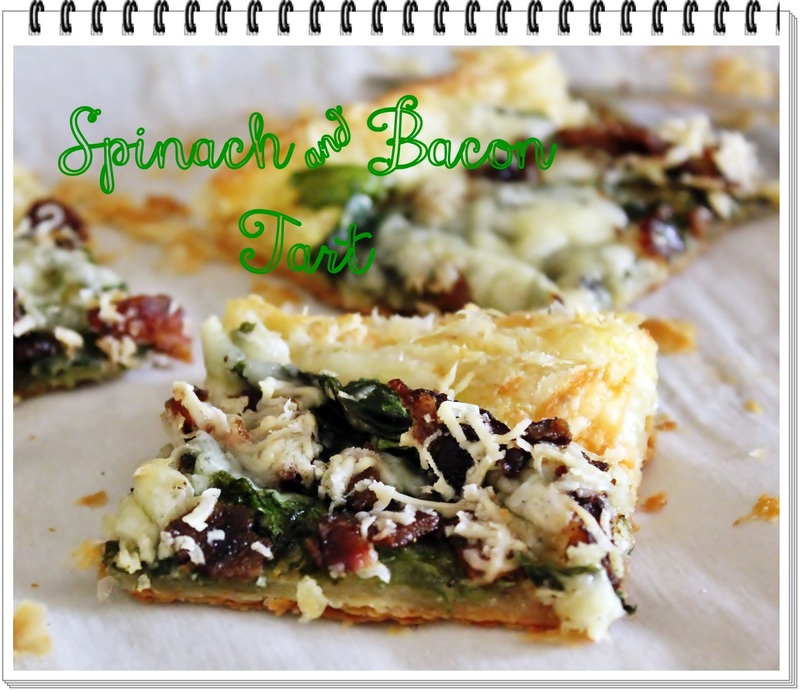 I am thrilled I love Spinach and definitely love bacon, this Tart recipe is a MUST try for me!!!! Thank you Heidy for stopping by. This is so easy, I hope you have a chance to try it. Tarts is one of my favorite things to make for a party! I can’t wait to give this one a try, especially with the bacon! Hi Maggie, This is so easy that it’s perfect for a party. Thanks for stopping by. This looks amazing!! I might try this when my in-laws come in town next. I bet they would love it, too! Hi Maggie, This easy to prepare recipe makes a really lovely presentation, sure to impress even in-laws. Thanks so much for stopping by. Hi Joanne, I too have a lonely sheet of #puffpastry in my freezer. Plus I have turkey #bacon, #goat Cheese and #Spinach too. I think I’m ready to whip this up for guests tonight! Thanks! Hi KC, your guests will be delighted with your tart. It’s so easy and love using the ingredients that you have. It always works. Thanks so much for stopping by. This looks absolutely delicious! Pinned!!!! Thanks for stopping by Brooke and pinning. You had me at bacon and sold me at puff pastry! Thanks for sharing at DBB- pinned! Oh I love all these ingredients and gruyere is my favorite! Hi Joy, Thanks so much, I’m glad I was able to make it to the party! G’day! Great tart and photos! Thanks Joanne, it’s one of those lucky shots! You had me at bacon 🙂 Pinned it. Looks beautiful Joanne. Thanks Dawn. It’s so good too. All of these flavors and textures go together like a hand in glove. Delicious. Yes they do Velva. I was lucky to have all these ingredients in the fridge at the same time.